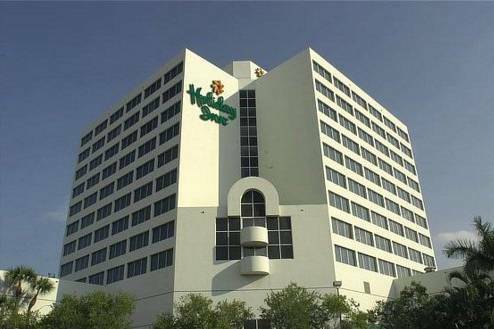 The Holiday Inn Palm Beach Airport Hotel consists of 199 recently remodeled guest rooms including the following in-room amenities: complimentary high speed internet access,coffee makers, hair dryers and irons with ironing boards. Guests can enjoy our outdoor heated pool, Polly's Restaurant & Polly's Spirits Lounge. Unwind at the end of the day in the fitness center, pool or sauna. Plan your next meeting in any one of our conference rooms encompassing over 7,000 sq. ft. of space. Business Center available in the lobby. Airport shuttle services offered. This hotel is committed to providing accessible facilities under the American Disabilities Act. If your accessibility needs are not met, please contact the Hotel Manager on Duty. Should you require additional information regarding accessible facilities for guests with disabilities, please call 1-800-Holiday (U.S. and Canada) or contact the hotel directly. For the hearing impaired, TDD service is available at 1-800-238-5544 within the U.S. and Canada.